I realize this is slightly bizarre. Me, here, cooking and taking pictures and writing about it. I'm not a chef, or a photographer, or an artist or a writer. I have a crappy camera, a tiny, oppressive, windowless kitchen. A dishwasher that cannot open unless the fridge is also open. My dishes are hand me downs, old and scratched and mismatched. I work late, eat a lot of sushi and ketchup chips. Sometimes I even eat pizza pops, frozen pizzas or microwavable Indian food. So me, doing this, I know is weird. When I had my concussion, and lost my memory, I am told I was very grumpy about the fact that I keep a blog. I claimed that it was stupid and that I was not going to do it any more. I still feel like it is silly. And I feel a little self-conscious every time I hit publish. Earlier today I felt especially ridiculous about my seven salads pledge. It just seems so odd. I have a list a mile long of things to do for my two jobs, I could use my time more effectively. This evening I arrived at home (Mike was working late), pulled all of my ingredients from the fridge, and laid them on the counter. I had this idea to make a pureed apple dressing but thought maybe I just would not post it. I figured, no one except me really cares if I actually make and post about seven salads. Then I proceeded to make my apple dressing. I put pureed apple in a pot, simmered it, strained it and with the juice made a wonderful dressing. And somehow, unintentionally I had a delicious, warm homemade apple sauce left over. I baked some thin apple and beet slices. They curled up, turned crispy and chewy and sweet and delicious. When everything was mixed together and I looked at my deceptively simple salad, I realized I had just spent an hour and a half in silence, thinking about nothing, just doing, and creating and enjoying myself. And I was so excited about the result that I could not wait to take pictures and write about it. Coming home at the end of the day, spending an hour or two in the kitchen, playing around, making a mess, composing a picture is fun. And the part where I sit down and write about my day is especially therapeutic. So even though this is silly, here I am; making seven salads for the pure fun of it. 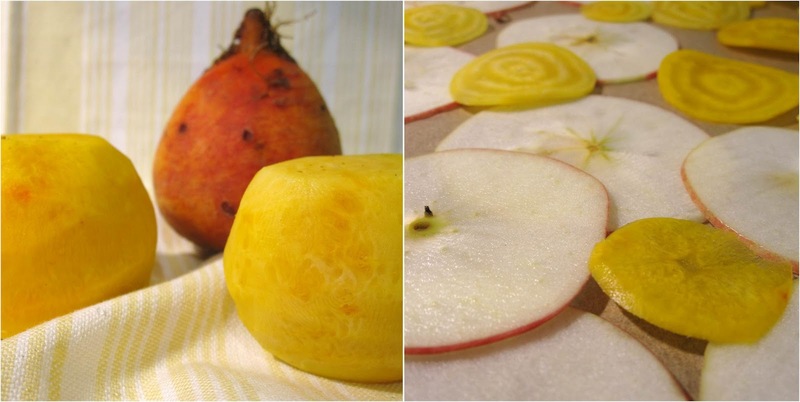 2 - Using a mandoline, thinly slice beets and one and a half (1.5) apples. 3 - Lay beets and apple slices on baking sheets covered with parchment paper. 4 - Brush one side of slices lightly with olive oil and bake. 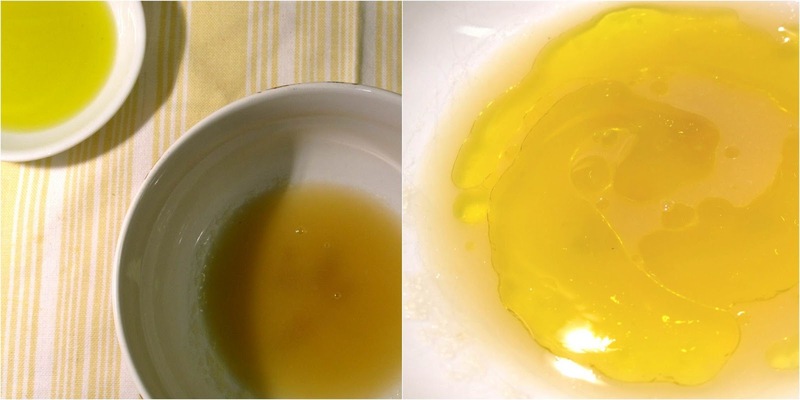 After 10 minutes, flip, brush the other sides with olive oil and bake another 10 minutes. 5 - Meanwhile, peel the remaining apples, chop roughly and puree in a food processor. 6 - Place puree in a saucepan, mix with the juice of 1/2 a lime, 1 tsp of honey and a couple tablespoons of water. Cover and simmer about 10 - 15 minutes. 7 - Puree apples again in processor, then place in a strainer positioned over a bowl, allowing the apple liquid to catch in the bowl. 8 - When most of the liquid is drained, whisk together with the juice from the other 1/2 of the lime and a couple tablespoons of extra virgin olive oil. Season with sea salt. 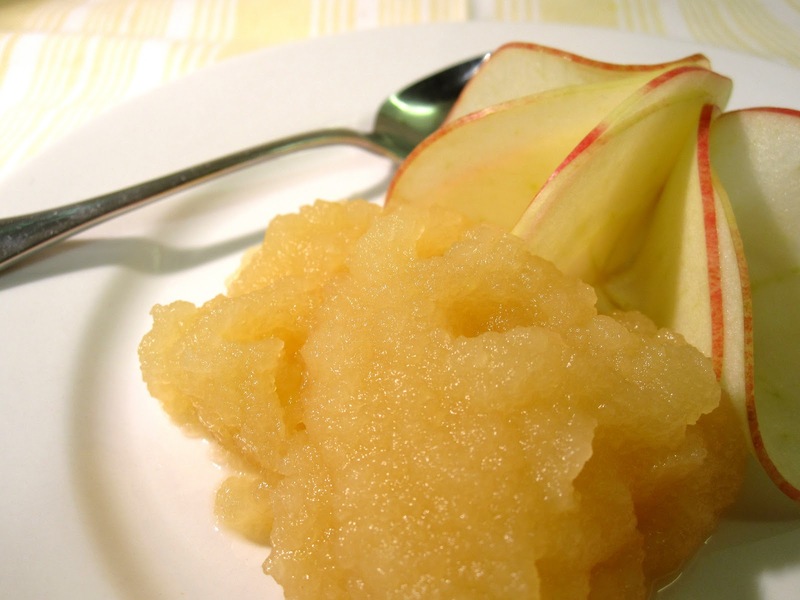 ***Note: the remainder of the apple puree can be eaten as apple sauce, stirred into some oatmeal, yogurt or as a topping for ice cream. 9 - Toss frisee (enough for two large or four small salads) with half of the dressing. 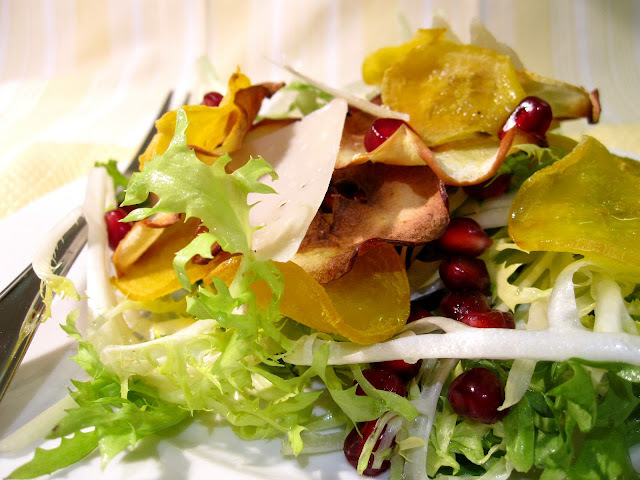 10 - Place frisee on serving plate, top with pomegranate seeds, apple slices and beet slices. 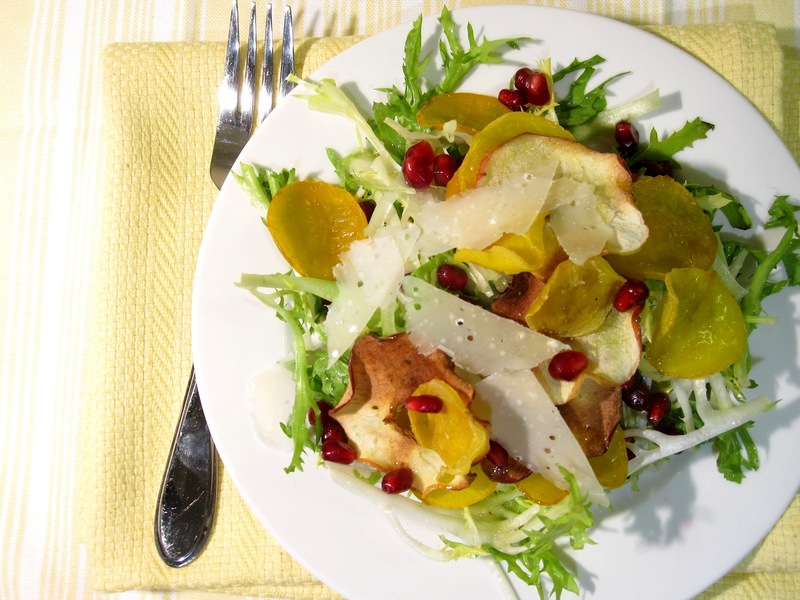 Garnish with freshly shaved parmesan and a drizzle of apple-lime dressing. where do u get yellow beet in the market?